We were certainly glad to hear from you again and it is interesting to know that you are about to be given an important assignment. 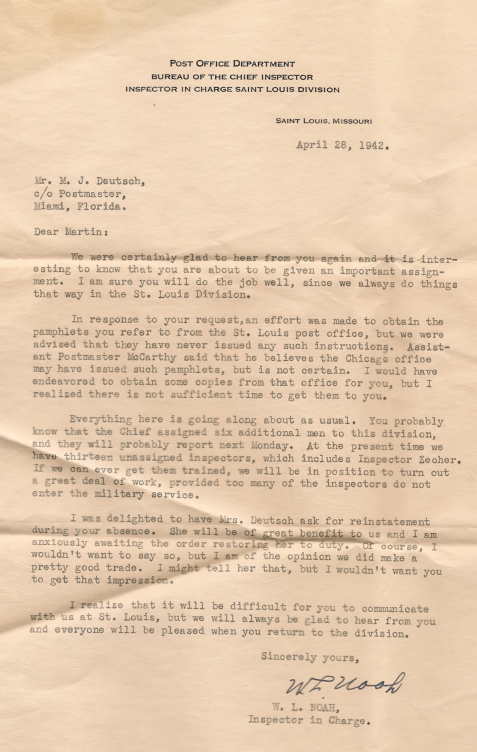 I am sure you will do the job well, since we always do things that way in the St. Louis Division. In response to your request, an effort was made to obtain the pamphlets you refer to from the St. Louis post office, but we were advised that they have never issued any such instructions. 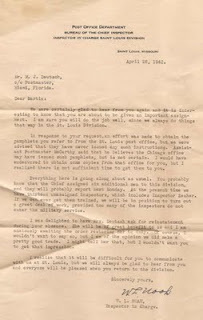 Assistant Postmaster McCarthy said that he believes the Chicago office may have issued such pamphlets, but is not certain. I would have endeavored to obtain some copies from that office for you, but I realized there is not sufficient time to get them to you. Everything here is going along about as usual. You probably know that the Chief assigned six additional men to this division, and they will probably report next Monday. At the present time we have thirteen unassigned inspectors, which includes Inspector Zecher. If we can ever get them trained, we will be in position to turn out a great deal of work, provided too many of the inspectors do not enter the military service. I was delighted to have Mrs. Deutsch ask for reinstatement during your absence. She will be of great benefit to us and I am anxiously awaiting the order restoring her to duty. Of course, I wouldn’t want to say so, but I am of the opinion we did make a pretty good trade. I might tell her that, but I wouldn’t want you to get that impression. I realize that it will be difficult for you to communicate with us at St. Louis, but we will always be glad to hear from you and everyone will be pleased when you return to the division. 1. I'm unsure what pamphlets my grandfather was seeking, though it appears he didn't receive them. 2. This letter does confirm what my grandmother wrote on Feb 14, 1943 when she described filling out her tax returns, and said she had started working in May. On April 28, W. L. Noah was awaiting her arrival. 3. In January of 1937, after marrying my grandfather, my grandmother had resigned from her stenographer role at the Post Office. She had been working there since 1920, so W.L. Noah knew her well, and this letter indicates he was quite pleased to have her back, though at the time he probably didn't realize it would be for over two years. I believe my grandfather expected to be home before the end of 1942.